Winter is coming…ready or not. 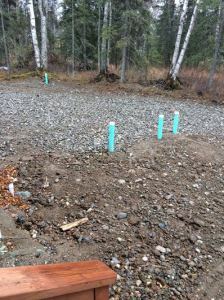 Before winter gets here make sure to know where your septic monitor tubes are. You need to know exactly where they are. Too many times we have had contractors digging all day to find a tube that is “about right there”. If you have buried your tubes or even cut them off at ground level, unbury them now. ,before the ground is frozen. You can imagine how expensive it is to have a contractor in your back yard with a jack hammer turning over 1/2 your frozen lawn in the pitch dark looking for your monitor tube. Believe me…it happens. At -20 degrees those contractors are NOT going to give your a deal. This is just a quick little reminder on behalf of all the engineers that have to dig in the snow and frozen ground to make sure your toilet flushes and the ugly stuff drains OUT of your house rather than IN.